How to search the web better with Safari Browser? Searching the web by going opening the search engine website like Google, Live etc. is always the best but not the speedest way, because the same search can be done through the browser directly from their toolbars. For Safari browser users, here is a plugin which can help in searching the web faster and in a better way – Inquisitor! Inquisitor is a plugin which is not only available for Safari, but also for firefox, IE too. And it enhances the speed of search you perform. You just type the keyword and a drop-down list keeps updating you with the relevant results before you hit enter to search. It just does not collect information from the web, but also goes through your browser history and shows whether you have searched the same keyword earlier, and also the number of times it was searched, the no. of visits and how long ago you visited the result page. Instant search! Get the results while you are typing the keyword. 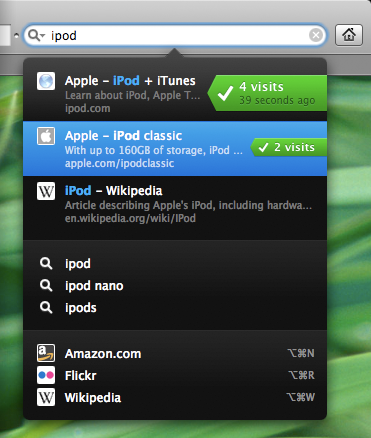 * Here are few Safari 4 tips for better browsing through Safari. I liked this Inquisitor which is a plugin that is not only available for Safari, but also for firefox, IE too. And it enhances the speed of search you perform.